In his first public media appearance since getting fired last month, former UCLA head coach Jim Mora told Colin Cowherd he is looking to return to the NFL after his six-year college stint. Mora, who was previously the head coach with the Atlanta Falcons and Seattle Seahawks, was fired after UCLA’s loss to USC last month. The Bruins hired Chip Kelly one week later. It was Mora’s first job in college, and he was consistently at the center of NFL coaching rumors during the beginning of his UCLA tenure, which were his most successful years in Westwood. He told Cowherd he appreciates the business-like atmosphere and structure of the NFL, but loved “the impact you can have on young men” in college more than anything else he’s experienced in coaching. “Of course it’s about winning and losing and that’s how you keep your job, but it’s also about making sure they get an education and they’re set up for their future and they’re socially conscious young men and they become the men that their parents always dreamed that they’d be,” Mora said. When asked about his prized pupil Josh Rosen and the chances the junior quarterback declares for the NFL Draft early, Mora said it’s a “reasonable approach” to think Rosen would leave UCLA considering that he is on track to receive his degree this year and he will be playing in an offense that may not be an ideal fit. Rosen said Wednesday he has actually thought about playing in a system like Kelly’s, but hasn’t made his NFL decision yet. “I know that he’s a brilliant enough offensive football mind to where he can tailor his offense to the strengths of all 11 players, not just the quarterback,” Rosen said. More on big decisions coming up for Rosen and some of his teammates, including Jordan Lasley and Kolton Miller. Jim Mora set out to start a “Bruin Revolution” when he came to UCLA. Nearly six seasons and a $75-million football facility later, the university is looking for someone to start a new wave. Mora had the most successful first three years of any UCLA head coach, winning 29 games in that span. But disappointing results in the past two and a half years cost the 56-year-old head coach his job on Sunday. Prized quarterback recruit Dorian Thompson-Robinson doubled-down on his UCLA commitment on Twitter on Monday, one day after the school fired Jim Mora. Thompson-Robinson, a four-star prospect out of powerhouse Bishop Gorman High in Las Vegas, is the crown jewel of UCLA’s 2018 recruiting class along with four-star cornerback Olaijah Griffin. The dual-threat quarterback is expected to compete for the starting spot immediately if junior Josh Rosen declares for the NFL draft after this season. Three-star defensive lineman Niti Liu also reaffirmed his commitment to the Bruins while linebacker Matthew Tago is seemingly starting to wane, although he writes that he’s still committed to UCLA. 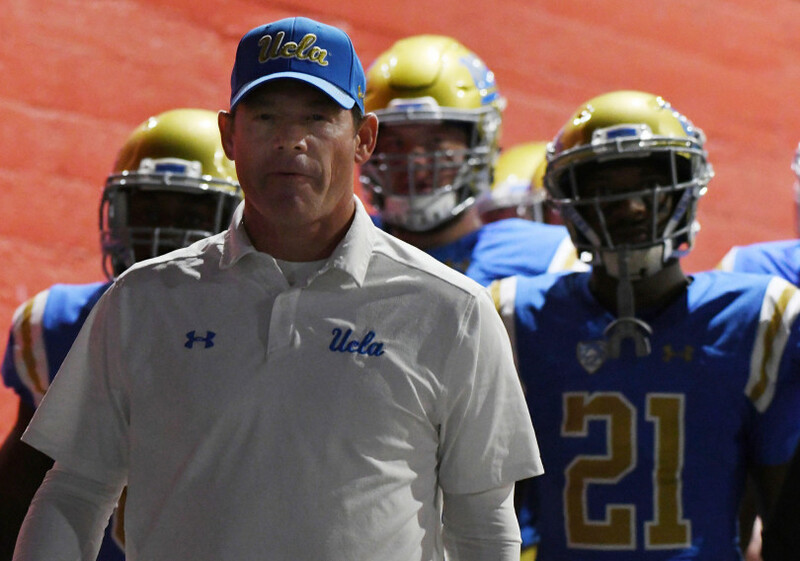 One day after UCLA lost its third straight rivalry game to USC, the school announced that it has fired head coach Jim Mora. Offensive coordinator Jedd Fisch will take over as interim head coach as the Bruins finish the regular season on Friday, Nov. 24 with a chance to clinch bowl eligibility at home against California. Mora is due a buyout worth more than $12 million. UCLA said the terms will be honored and covered by department-generated funds. Mora started his career with the most wins in his first three seasons for any UCLA head coach, but went just 17-19 since the beginning of 2015. The Bruins went 4-8 last season. Head coach Jim Mora talks about his team’s performance against USC, Jordan Lasley‘s big night and what a bowl game would mean to the team.